Office Coffee Service: Get It Delivered Fast and Fresh! Office Coffee Service from Galaxie Coffee guarantees that you’ll never go a morning without a cup o' joe (or two). Find your favorite K-Cup flavors in our vast selection of products or expand your horizons with juice, soda, iced tea, and more. We’ll deliver the order straight to your office, so all you have to do is sit back and take a sip. Whether you’re a CEO looking to boost your employees’ energy levels or a producer keeping your crew on point, Galaxie Coffee has business coffee service options at competitive rates. Business coffee service is an affordable option for offices needing to stay well stocked with drip and single-serve coffee and tea products. With regular, flavored, and decaf options available, we have something to satisfy the coffee cravings of everyone in the office. Galaxie Coffee maintains a strong reputation as one of the top full-service coffee and beverage providers in the New York Metro Region, and we pride ourselves on delivering great-tasting products at top rates to offices around Manhattan, Long Island, Queens, Brooklyn, the Bronx, Westchester, New Jersey, and Southern Connecticut. In addition to our premier coffee options, we also deliver a wide variety of breakroom supplies. From cleaning products to garbage bag liners, we have everything you need to maintain a clean and sanitary office. Best of all, we ship our products together, so that everything comes in one delivery, with one easy to follow invoice. 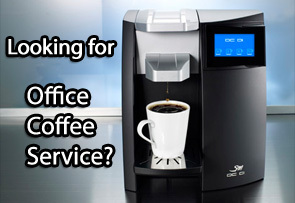 Call today and be prepared to experience the best office coffee service in the "Galaxie"! Galaxie Coffee was founded by Leonard Robbins and his son Neil, who is actively involved in running the business. The current management team of Joseph and Ed began their association with Neil in December 2005. Since then, Galaxie Coffee has more than doubled in size through organic growth, as well as the acquisitions of Regal Coffee and All Island Janitorial Supply. The acquisition of Regal Coffee in February 2008 enabled Galaxie Coffee to broaden its customer base in Nassau and Suffolk counties. The acquisition of All Island Janitorial Supply in November 2008 has allowed the company to significantly widen its product offering with more industrial cleaning supplies and many floor care products, including equipment. It is through this association with All Island Janitorial Supply that we’ve begun to offer green cleaning supplies to our customers. It is our expectation that the green cleaning supplies segment will be a fast growing part of our janitorial supply business in the near future.